Beyond Productions Pty. Ltd. 1990. Director: George Ogilvie. Music: Martin Armiger. LP	(ST)	Regular. TVL93336. (CD). 1990. Music by Martin Armiger. Produced by Martin Armiger except * Pete Wingfield, ** Tin Machine. Executive Producer: Martin Fabinyi. Engineered by Michael Stavou except * and **. “Main Titles”, “The Chase” and “Love Theme” Composed by Martin Armiger. Recorded at EMI Studios 301 Paradise Studios & M.A.R.S. Mixed at EMI Studios 301 & M.A.R.S. Conducted by Derek Williams. Guitar - Rex Goh. Voice - Tanya Sparke. Drums - Mitch Farmer. 1st Violin - Phillip Hartl. Cello - Tony Morgan. Keyboard Programming & Samples - Stu Storm. Strings Orchestrated by Derek Williams. Orchestral Leader - Phillip Hartl. Copyist - Andrew Wilkie. Music Clearances - Meyrick Smith. Assistant to the producer - Vashti Rosenberg. Assistant Engineering - Ian Loomis, Paul Grant, Simon Woolley. Main Titles. (Martin Armiger). (EMI Music). King Of The Road. * (Roger Miller). v: Proclaimers. (Warner/Chappell). Recorded at R.G. Jones, London & R.E.L. Studios, Edinburgh. The Proclaimers appear courtesy of Chrysalis Records. v: Kate Ceberano. (Warner/Chappell). Recorded at EMI Studios 301. Drums - Peter Jones. Bass - Stuart Speed. Guitar - Ross Hannaford. Keyboards - Jex Saarelaht. Strings conducted by Derek Williams. Strings led by Phillip Hartl. She’s Not There. (Rod Argent). v: Crowded House. (Essex). Recorded at Metropolis Audio. Mixed at EMI Studios 301. Crowded House appear courtesy of Capitol Records. For Your Love. (Graham Gouldman). v: Peter Blakeley. (MCA). Recorded at Paradise Studios, EMI Studios 301 & M.A.R.S. Mixed at M.A.R.S. Backing Vocals - Mark Williams. Percussion - Mitch Farmer. Bass - Leon Gaer. Guitar - Rex Goh. Soprano Saxophone - Jason Morphett. Peter Blakeley appears courtesy of Capitol Records. Mark Williams appears courtesy of Albert Productions. Betty Wrong. ** (David Bowie/Reeves Gabrels). Here Comes That Feeling. (Joe Osborne/Dorsey Burnette). v: The Cockroaches. (Albert/Gilbey). Recorded at Powerplant Studios. Remixed at EMI Studios 301. (Bob Feldman/Gerald Goldstein/Richard Gottehrer). v: The Chantoozies. (EMI Songs). Recorded at Metropolis Audio. Mixed at M.A.R.S. Percussion - Alex Pertout. Keyboard Programming - Brett Goldsmith. The Chantoozies appear courtesy of Mushroom Music. (Brian Holland/Lamont Dozier/Eddie Holland). v: Stephen Cummings. (EMI Songs). Recorded at Metropolis Audio. Mixed at EMI Studios 301. Keyboard Programming & Guitar - Shane O’Mara. Piano - Paul Grabowsky. Backing Vocals - Rebecca Barnard, & Susie Ahern. Steven Cummings appears courtesy True Tone. (Edward Heyman/Victor Young). v: Jenni Forbes. (Warner/Chappell). Recorded & Mixed at M.A.R.S. Piano - Derek Williams. Synths & Solo - Paul Najar. (James Lee). v: The Cockroaches. (Warner/Chappell). Recorded at Powerplant Studios & Rich Studios. Remixed at EMI Studios 301. 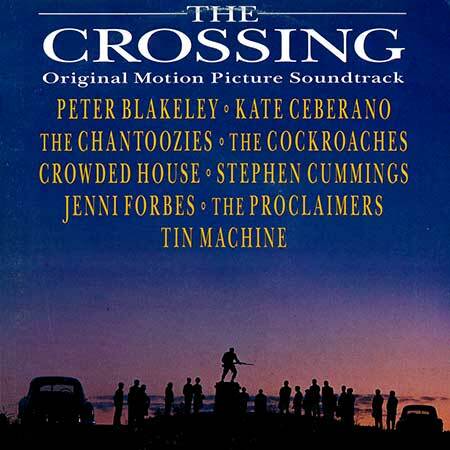 CD(t)	(OP)	(See COMPILATIONS - MORE GREAT AUSTRALIAN FILM & TELEVISION THEMES: Tk16).